Soy wax is completely natural, it is made right here in Swanton Ohio, from American farmers soybean crops. Soy bean wax is 100% environmentally friendly, sustainable and renewable without any chemicals or harmful additives. Soy wax is clean burning, lead free, and as such, has a much higher throw than any other candle. 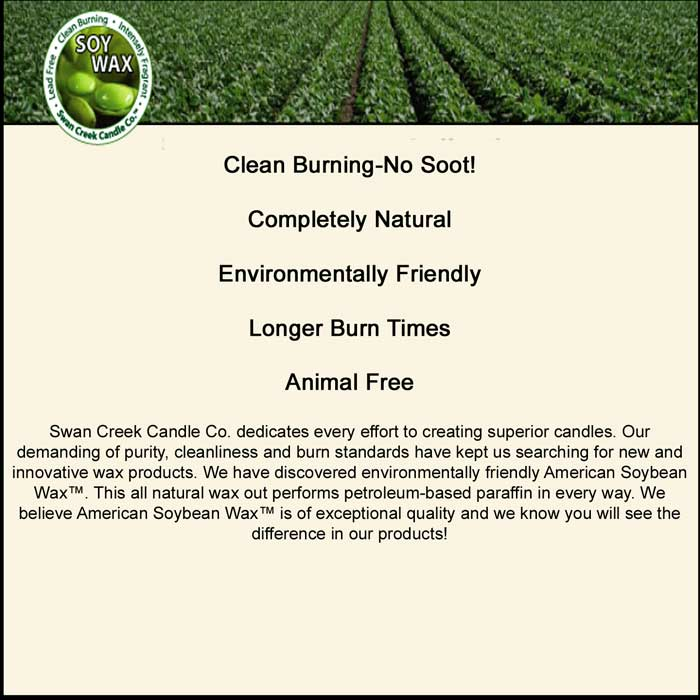 People ask, “why Swan Creek Candles?" What makes us different? Well, for nearly 40 years we have been family owned and operated. Our factory is located in Swanton, Ohio and we employ many members of the American work force from our local community. All of our candles and wax products are made in house, and all of our products are independently tested at our lab to ensure the highest quality.Our American Soybean WaxTM burns pure, with beauty and aroma; plus, it burns longer than paraffin AND is made from a naturally renewable source. For best results, please follow these burning suggestions: burn 4 to 6 hours to create a large wax pool, extinguish, cool, relight. We have increased our oil content to the maximum so that the wax will allow for soot free burning. Please avoid drafts, as this will cause some smoke. Because a low temperature flame is not able to completely combust the wax fuel, it is important that the wick remain still, centered, and draft free. Swan Creek Candle Company(R) dedicates every effort to creating superior candles. Our demanding purity, cleanliness and burn standards have kept us searching for new and innovative wax products. This all natural wax out performs petroleum-based paraffin in every way. We believe American Soybean WaxTM is of exceptional quality and we know you will see the difference in our products!